This isn't, by any means, a final review of The Witcher. I've played it fairly intensely over three weeks, and am only into the fourth chapter. Which is great, because there is more to come. But, what do I think of the show so far? I'm extraordinarily impressed. I'll come back later to talking about it as a game, but I want to stand back and talk about it in comparison with other media. It's worth comparing it with Kurosawa's Seven Samurai, or - perhaps especially - with Eastwood's High Plains Drifter. It is story telling of the same order, but more than that it is story telling about the same issues; about worlds so tainted with violence and cruelty that all moral actors are tainted. Geralt, the hero whose role you play, is himself a tainted character, edgy, over-aggressive, harsh in judgment. And you will play him like that, no matter how much you want not to. But he's not an amoral character. He's trying to make the best choices he can in a murky and uncertain world. Again - comparing to cinema, it's only by comparing this with cinema that you can do it justice - the scenery is gorgeous. The quality of the light at dawn and at sunset is just stunning. The trees are so lifelike that you can easily recognise each different species. The representation of a medieval European city, with all its grandeur and all its squalor, is extraordinary. You can almost smell it. Somewhere in the production process a decision was taken that every word spoken by every character should be voice acted - and they are. The voice acting is extremely good (as a Scot, I enjoyed the gag that all the dwarves have Scots accents). It isn't just the significant characters who are voiced, either - people you pass in the street are having conversations with one another, and if you eavesdrop on those conversations you pick up valuable plot clues. But the decision to voice all the characters has curious effects that aren't entirely good. As a player you expect these beautifully rendered, beautifully spoken characters to have a much richer conversational repertoire than they have. Indeed, I suspect that if the dialogue had been largely text, it would have been economic to provide much richer dialogue. Most of the characters have been individually modelled - and many are individually motion captured. Old people move rheumatically, children skip, dwarves stomp, whores sway and drunks weave. And that makes the few cases where significant character models are reused (the naiad and the dryad, for example; the cannibal and the fisher king) stand out awkwardly. Also, and more seriously, I suspect the game's creators have been poorly served by the English translation. Very often the English language dialogue seems anachronistic, over-modern. Which brings me to the game's Polish roots. I think to fully understand this game and the books on which it is based you need an understanding of Polish history. Yes, it's a fantasy about elves and dwarves and magic. But it's very easy to read the Order of the Flaming Rose as being the Teutonic Order, and the elves and dwarves as the indiginous Prussians and Slavs; or equally, to see the Flaming Rose as being the Nazis (who, after all, consciously emulated the Teutonic Order) and the elves and dwarves as representing the Poles and the Jews. I don't know to what extent that is what the authors intend, but at some level this story is rooted in Poland's long history of genocidal war. It benefits from that. Its creators understand what genocide means, about how hard it is to stand aside; about the scale and devastation that this sort of war brings. This is a deeply felt story, in a way in which little modern fantasy really is. For the rest: combat? Yes, if all you want to do is hack and slash this game is not for you. The camera? Yes, sometimes the camera movement is disconcerting. 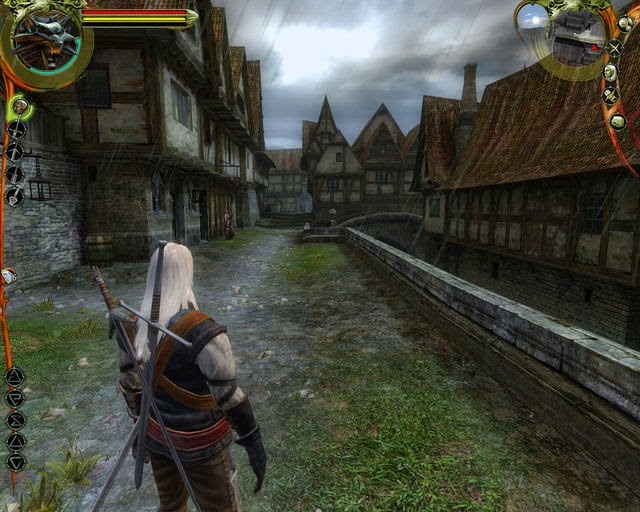 Where in other game engines the game will happily remove walls and whole buildings if they get in the way of the camera, the Witcher's camera manouvers around buildings and trees and sometimes that movement is awkward. To be fair, there are alternative camera was modes available, but I didn't find the camera a problem.